The Nate or the N8 doesn’t have the LED lights for still images and video support but it has the most advance flash for cameras, the Xenon. But when we are talking of what Xenon can’t do, the flashlight tools is missing. But don’t worry now ‘coz the AMOLED, Flashlight touch and Qtorch will solve it all. There are two apps which I consider great in giving light during brownout or in the event of shorted of light. First is the Qtorch for N8 and lastly the Flashlight touch which already existed from many S60v5 devices. 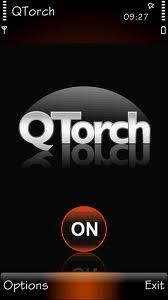 QTorch – A simple application that you could use as remedy to flashlights on your N8. With just simple tapping on the screen for off and on, then you’re good to go with white screen. Flashlight touch – Another flashlight app that uses the screen’s brightness. But with this app you can actually blend and create colours that you prefer. Yo mamhen, i got a problem with Qtorch, just want to share it with everyone. When light ambient sensor is enabled, when you turn on qtorch, after a few moments the light will dim because the light sensor detects the sorrounding are as dark thus automatically decreasing the display brightness to save battery life. I think this application damages the phone’s display, giving it the “purple black” problem because it forces the leds to be brighter than they should be.